This is a pretty remarkable invention for it’s time. 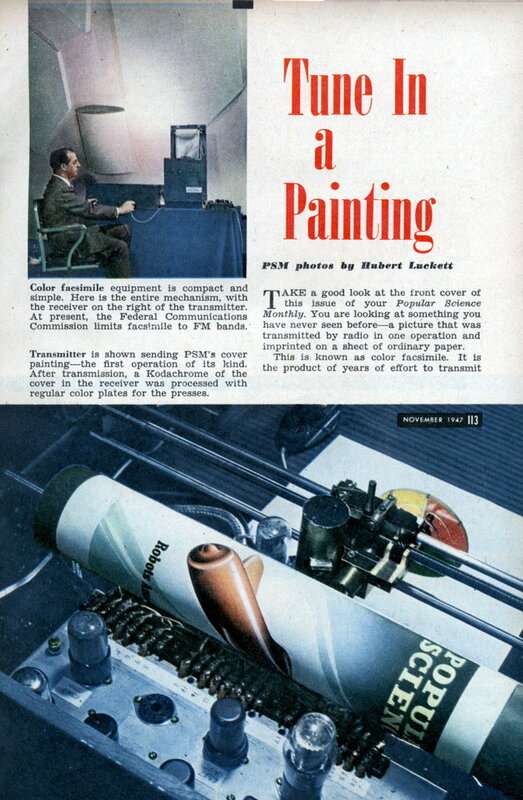 A color, plain paper, fax machine from 1946 that used colored pencils to print the output. The resulting image looks a lot like a printout from my first color inkjet printer. Sending a 7×10″ picture in full color took about 15 minutes, which seems pretty damn reasonable to me. 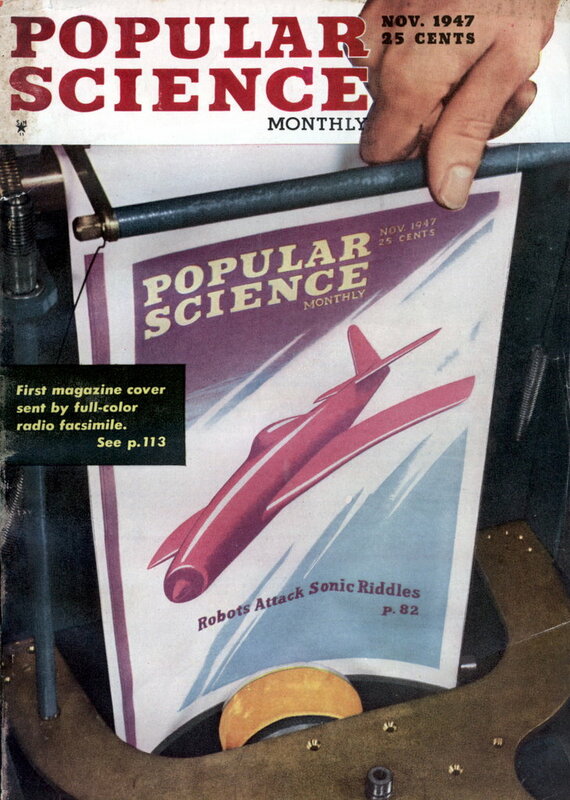 TAKE a good look at the front cover of this issue of your Popular Science Monthly. You are looking at something you have never seen beforeâ€”a picture that was transmitted by radio in one operation and imprinted on a sheet of ordinary paper. The first Colorfax machine was built by Dr. La Verne R. Philpott in his home workshop with “a drill press, a lathe and a couple of screwdrivers.” It was demonstrated this fall in the WGHF studio in New York, and a commercial model, which will plug into any FM radio and will retail for about $150, is being designed now. You can listen to a radio lecture on any subject under the sun and look at illustrations accompanying the lecture as they roll out of the facsimile machineâ€”in color. If the lecture is on atomic energy, you can support your understanding of what you hear with colored charts. If it’s on automobile repair, you can look at the part under repair in color. Afterward, if you want to, you can tack the picture up in the garage. That distinguishes facsimile from television. Television transmits a fleeting record, facsimile a permanent one. Sunday morning’s comicsâ€”in colorâ€”can be delivered to your children right in your own home by radio, along with news for the grownups that is “printed” as it is on a newspaper rage. Facsimile puts a genie in any man’s house, answerable to command. If the whim strikes you. you can squirt the incoming pictures or news onto a wire recording tape or an ordinary phonograph record and then “print” them on paper at your leisure. That’s possible because the radioed impulses causing the facsimile receiver to work can be converted into either sound or something to look at. The sound isn’t musical. It’s like a mouse’s squeak intermittently interrupted by a scratching noise. Facsimile is not new. Color facsimile is brand new. Good black-and-white facsimile was made possible more than a decade ago when a means was found for converting the tone gradations on a photograph or a printed page into impulses that could be sent by wire or wireless, and then be reconverted on photosensitive or electrosensitive paper into a duplicate of the original. Facsimile was used extensively during the war by the armed services. Even before the war, miniature facsimile newspapers were being broadcast daily by 19 U. S. radio stations to several thousand owners of receiving sets. Today ordinary facsimile transmits news from the United Nations headquarters on Long Island, New York, to a central distributing point. The transmissions are in Chinese, Arabic, Hebrew, Russian and other languages, doing away with the bother of translation. That’s fine for black-and-white reproduction. But how about color? Up to a few months ago, for any practical purpose. it was no go. Occasionally a color picture was sent experimentally by radio. This required breaking down the picture into its primary colors, separating each color, transmitting each one separately, and then putting the whole mess together again at the receiving end. It took too long. There was too much chance of “bad registers”â€” one color overlapping another. There had to be a simpler way. There was. Capt. W. G. H. Finch, who obtained his first facsimile patent more than 10 years ago, found it. Color facsimile not only is simple, but for the first time in facsimile of any kind it uses plain, ordinary paperâ€”any kind of paper will do. The use of paper that doesn’t have to be sensitized and sometimes moistened to boot, or photo-developed after receipt of a transmission, makes operation of the receiver easy. This is the way color facsimile works: The item to be sent, be it picture or words, is fastened to a revolving drum A pin-point light looks at the item with a fineness of 100 lines to the inch. The light is reflected into a photoelectric cell, which transforms variations in the intensity of the reflected light into electrical energy. A filter disk separates the colors from one another. The light source, photocell and filter are mounted on a single carriage that moves along as the drum rotates. The energy from the photocell is amplified and imposed as modulation on a carrier wave. The receiver is something else. Essentially it is a series of mechanical pencils that can be made to mark a line on paper in accordance with the instructions it gets from the transmitter. When the portion of the item before the scanner in the transmitter is red, the transmitted signal instructs the receiver to make a red mark on the paper. If the signal says blue, the paper gets a dose of blue. Mixed colors are produced by blending the three primary colors, and black is added to improve contrast and strengthen dark areas. Black-and-white facsimile can be stepped up to a transmission speed of 44 square inches a minute (equivalent to about 500 words on a printed page), but color facsimile has a limiting factor. Since four pencils have to be given a chance to make. a mark on every line, the color transmission is only one-quarter as fast as black-and-white, which requires only one mark per line. Sending a 7- by 10-inch picture in full color, for example, requires about 15 minutes, although this speed is expected to be doubled in the commercial Colorfax model now being designed. I love the idea of printing using colored pencil to print the image, it would be nice to DIY my printer to do that.